Last year I bought Roosevelt Island Christmas/Holiday Cards from a man who lived on the island. Does anyone know if he is selling them again this year? I hope he is because I love his reindeer driven Roosevelt Island Tram cards and bought some last year at his booth in the Motorgate Atrium. If you are looking for that special Roosevelt Island holiday gift, check out the Historical Society Kiosk this weekend. 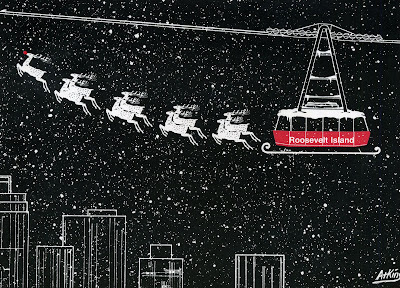 UPDATE - 12/16 - Information on ordering the Roosevelt Island Tram Reindeer Cards here. A dinner for two that was at least three courses in a restaurant structured that way — and a similar amount of food in a restaurant that wasn’t — would be $99 or less, including tax and a tip of 20 percent on the total of the check before tax. I excluded drinks from that budget since diners have vastly different appetites for alcohol and other beverages, the surest inflators of a check. Hundreds of tenor and bass tuba players congregate on the Rink at Rockefeller Center on Saturday, December 13th at 3:30pm playing Christmas carols and other crowd favorites. The tubists of all ages line up under the great Christmas Tree and fill the area with the organ-line sound of low brass. Spectators are encouraged to sing along with the Christmas carols and other well-known songs. The NY Times provides a variety of additional Christmas and Holiday music, dance and theater happenings going on in the New York City area this weekend and through December 25. Art lovers will soon have a fun and free way to see all that Brooklyn has to offer. Tourism officials announced the smArt Brooklyn Gallery Hop today. On December 14th, free shuttles will run through four different gallery districts, making it easier for participants to see as many exhibits as possible. Sixty-four participating Brooklyn art galleries will offer exhibitions and refreshments from 1 p.m. to 6 p.m.
"I think there is that perception that Manhattan is the only place for art, but we are changing it very rapidly," said Brooklyn Arts Council President Ella Weiss. Maybe you're in the mood to knock some things down. Try hitting the pins at The Gutter Bowling Alley in Williamsburg. Time Out New York lists other New York City Bowling Alleys though none are located on Roosevelt Island. On Roosevelt Island this weekend, the Farmers Market will be open on Saturday as is Gallery RIVAA, the Roosevelt Island Visual Arts Association which is featuring the Winter of Change group show. Also, RIOC has produced a great self guided tour map (PDF File) of Roosevelt Island for any visitor or resident looking to stroll the Island and learn something more about it. Here's a disturbing and all too real video of a subway passenger being harassed on the Q subway line in Flatbush Brooklyn via the Ditmas Park blog. There is no reason why this could not happen at anytime or anywhere in the subway system including the Roosevelt Island F Train. Fire- Smoke Condition- At the R.I. Flower Shop. PSD responded. EMS refused. No injuries. It appeared to be an electrical fire. PSD evacuated nearby areas. PSD with assistance of Urban American were able to contain the fire and prevent it from spreading. FDNY responded and extinguished it. Noise Complaint- of furniture being moved constantly. PSD responded and corrected the condition. Smoke Condition- Burnt food. No injuries. UA notified. EMS refused. Windows open to air out the smoke. Criminal Mischief- Cracked Window. Search for the subject yielded negative results. UA notified. Follow up (Robbery on 11/24/08) - Alleged victim recanted original report of being robbed. He stated that he wanted to drop the complaint he made up about being robbed and the incident did not take place. Aided - Fell on street and hit his mouth. PSD officer responded and aided appeared to be intoxicated. Aided transported to hospital. Aided - Notified PSD that she was having chest pains. EMS was called. Aided refused transportation to hospital. Arrest (Unlicensed Operator) - Motorist was observed making illegal U-turn and was stopped. Motorist was arrested and taken to 114 pct. for processing. Assault 3 - PSD responded to report of domestic dispute. Victim and subject were having verbal dispute when subject started choking her. Subject was arrested and taken to 114 pct. for processing. 0700 hrs. Friday December 5th 2008 thru 0700 hrs Saturday December 6th 2008. Barking Dog - Tenant reported to PSD an ongoing dog barking for about one week. PSD advised tenant to see Urban American Management. PSD Filed report. Aided - Female tenant not feeling well, transported to the Hospital. Found Property - RIOC Driver bus number 4 found prescription of medicine. Owner was notified and items returned. Found Property - Tram Supervisor reported to PSD found black bag left behind. Property secured inside PSD. Criminal Mischief- Lobby door glass broken. Search for the subject yielded negative results. UA notified. Arson- In building. A stack of papers burnt on the carpet. Search for the subject yielded negative results. PSD responded and FDNY. It was referred to the Fire Marshall. Property Damage- Paint on an apt door damaged. Search for the subject yielded negative results. UA notified. Alcohol/Open Container- Subject was warned and admonished by PSD. Criminal Mischief- Broken window in building. Search for the subject yielded negative results. UA notified. Trespass- 2 Subjects arrested by PSD..
Criminal Mischief- Hallway mirror ripped off. Search for the subject yielded negative results. UA notified. Criminal Mischief- Front window shattered to RIOC BUS. Search for the subject yielded negative results. UA notified. Aided- Female fell on the sidewalk and refused EMS. Aided- EMS responded to apt Tenant refused to allow PSD. entry and to provided information. Past Fire- Insurance company adjusted responded to 568 Main Street to conduct an investigation. Trespass/Open Container- 2 Subject arrested by PSD. Trespass/Alcohol Open Container-4 Subjects arrested by PSD. Harassment- Between 2 tenants over money. NYPD refused. No injuries. Missing Property- Money missing from apt. NYPD refused. Aided- An ill person was taken to the Hospital by EMS. Investigation- Tenant reported mold in apt. UA notified. Criminal Mischief- Slide door latch to roof door broken. Search for the subject yielded negative results. UA notified. Aided- Intoxicated male fell and was unstable. EMS transported him to the Hospital. Property Damage- Broken clamp on metal bar that held the RIOC Holiday Banner. The Banner was secured in PSD. RIOC personnel notified. Aided/Handicapped Person- Coler Hospital patient in wheel chair inoperable and transported to the Hospital by RIOC Bus. Coler Hospital PD attended to patient. Unsecured Vehicle- Driver's side door open. Central Parking provided owner's phone number and PSD notified the owner. Investigation- Island resident reported an off Island incident in which she was threatened by a third party. She will go to precinct of occurrence. Investigation- Report of a package mailed at the Post office and stated he later saw it in the hallway by his residence. He will check with the Post Office. Verbal Dispute- Between a male and a female. No injuries. NYPD refused. Female left apt. Violation of Court Order-Between father and mother of child over visitation of child. Matter referred to Family Court. Disorderly Conduct- 2 Subjects fighting in the street arrested by PSD. Complaint/Investigation- Tenant smelled odor of marijuana in the morning near his apt and reported the incident in the evening. NYPD refused. Search of the area conducted with negative results. Investigation- Tenant alleged that a contractor took his citizens papers PSD responded and found papers underneath other papers in apt. Criminal Mischief- On the first and fourth floor two windows were broken. Search for the subject yielded negative results. UA notified. Water Leak- In apt. PSD and UA responded. UA corrected the water leak. Fire Investigation- In AVAC Chute. PSD and UA responded and no injuries. No property damage. It was extinguished by UA personnel. Search for the subject yielded negative results. Investigation-Victim stated suspicious female attempted to assist her with use of ATM machine in Duane Read. Assistance was refused. Outside female spit in her face. NYPD was refused. Search for the subject yielded negative results. Unsecured Property- A Fuel Power Box. UA Handyman responded and secured it. EDP- Male threatened to commit suicide. EMS transported him to the Hospital. No injuries. Unlawful Poss. of Marijuana/Loitering/Trespass/ Open Alcohol container- 2 subjects arrested by PSD. EDP/Aided- Male with a history of mental condition was taken to the Hospital by EMS. Investigation- Female harassing a male resident asking for money. Female fled. Search for the female with negative results. NYPD refused. Lost Property- Fur Coat and a pocket book. They belong to an Island resident and were returned to her. False Alarm- In apt. PSD and Manhattan Park Super responded and no fire all in order. The alarm was shut off by the Super. Criminal Mischief- Broken window in the building. Search for the subject yielded negative results. UA notified. NYPD refused. Vehicle Accident- Between a vehicle and a RIOC Bus. No injuries. EMS refused. NYPD prepared a report. Harassment - Resident reported to PSD that another resident is harassing her because she has a small dog in her apt. Reporter will go to housing management. Hazardous condition - PSD officer observed entire window frame and glass removed from hallway. No contractors or safety measures were present to prevent serious injury. Super was notified. Contractor returned to location and project manager was notified. Trespass - PSD officers arrested (3) three subjects. All subjects were issued criminal court summonses and released. Aided - Resident reported pain and was transported to hospital. 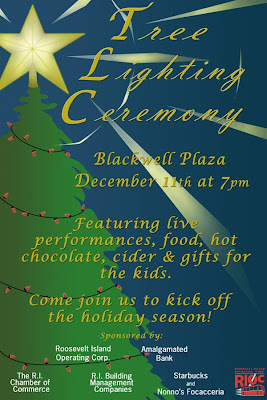 Due to the inclement weather, the Tree Lighting Ceremony has been rescheduled to Monday, December 15th at 7PM. 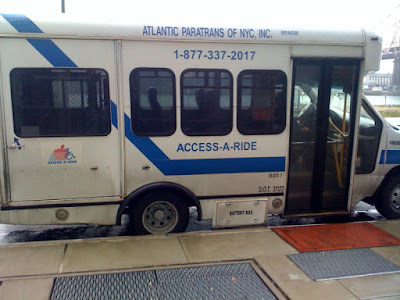 You may already be aware of the MTA’s troubling proposal to double the Access-A-Ride fare. The magnitude of the MTA’s budget crisis will require exploring all realistic options to close the gap; however, this proposal places an unfair burden on some of our city’s most vulnerable riders. I am calling on the MTA to withdraw this proposal. I hope you will join me by signing the petition at this link: http://www.petitiononline.com/mbpo/petition.html and encouraging your friends, colleagues and fellow advocates to do the same. A PDF version is attached for you to distribute at meetings, at your organization, or to anyone who may appreciate a print copy. Please make sure to return all signed petitions to my office at 1 Centre Street, 19th Floor for delivery to the MTA. If you have any question, please contact Jessica Silver, my Deputy Director of Community Affairs and Constituent Services, at (212) 669-8135 or via email at jsilver@manhattanbp.org. More from NY 1 including video of press conference by elected representatives and a guide to the MTA Access-A- Ride program. 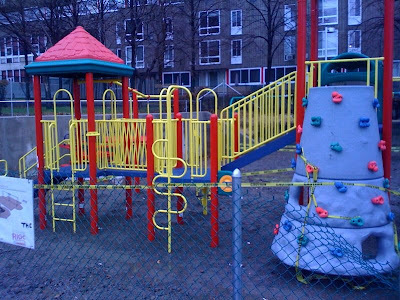 I enjoy the cold winter weather and snow but on a dreary and rainy December day, the arrival and installation of new equipment for Blackwell Playground brings thoughts of spring. and the roof of adjoining building. Somebody was on the Queensboro Bridge during a Roosevelt Island Tram rescue drill and captured this footage of a rescue bucket going up to meet the stranded Tram Cabin. Pretty neat but hope I don't have to do it! Here's how Portland Oregon handles their Tram rescues. Although you would not know it by the warm and rainy weather today, it is soon coming on Christmas and cold winter days which reminds me of this great song. 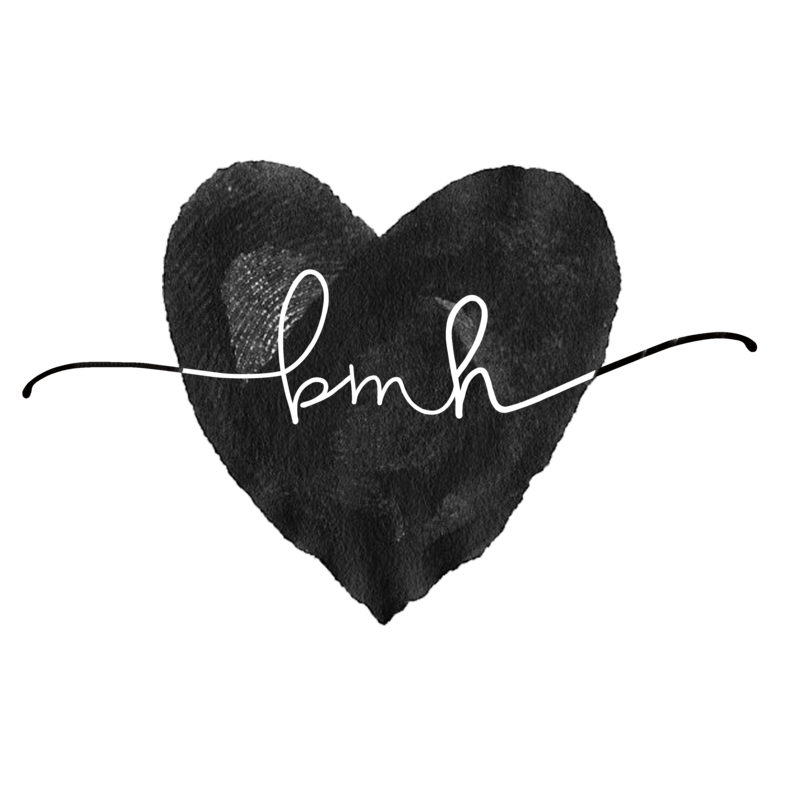 This is a wonderful version of Joni Mitchell's song River, sung by Sarah McLachlan. 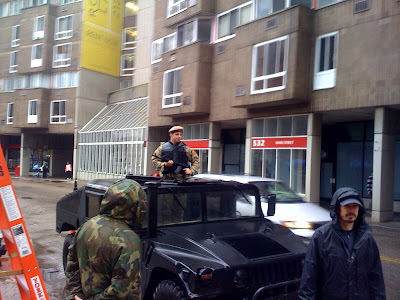 Heavily Armed soldiers rumbling down Roosevelt Island's Main Street in a caravan of armored vehicles. Sick of the objections by some Roosevelt Island residents, have the supporters of the Kahn/FDR Memorial finally decided to employ unilateral military action and take over Southpoint Park once and for all? Nah. 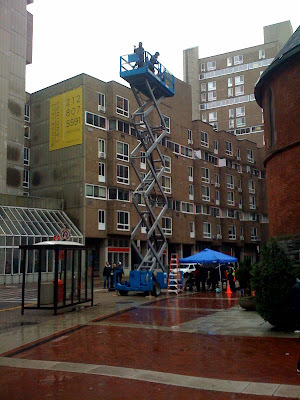 It just that a new NBC show called Kings is shooting some scenes today on Roosevelt Island and is the reason why the parking advisory was issued for today by RIOC. The producers of “Life on Mars” are deeply grateful to the city of New York and its residents for their goodwill and hospitality. We ask their patience with any temporary inconveniences our filming may cause and we apologize if our activities have had an adverse impact on any citizen’s daily life. 3) Clean-up all waste created by the shoot. Here is some more information on prior TV and movies shot on Roosevelt Island as well as how to get required permits and approvals. Effective 12:01am on Wednesday, December 10th, parking will be prohibited along Main Street between 501 and 575 Main Street due to a film shoot. Normal parking rules will resume Wednesday, December 10th at 3pm. The traffic disruption should be minimalized by the time (10AM-1PM) scheduled for the shoot. 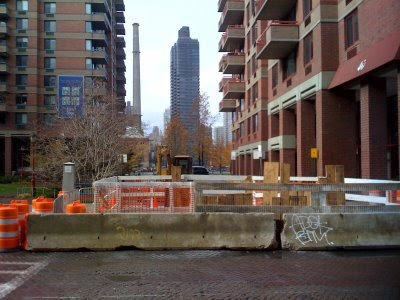 RIRA President Frank Farance sends the following report to the Roosevelt Island community. 2. RIOC agenda item -- Southpoint Park: Authorization to issue a Negative Declaration under the State Environmental Quality Review Act; approval of the plan and project; authorization to expend funds and to enter into contracts for construction. In short, RIOC has determined that the Trust for Public Land (TPL) portion of Southpoint Park has no environmental impact. Residents asked questions about the FDR memorial project, which is unrelated to the RIOC Board agenda item. Earlier, I had asked RIOC President Steve Shane about the community's preference, as registered in the recent referendum question, for completion of the memorial park before the memorial monument. 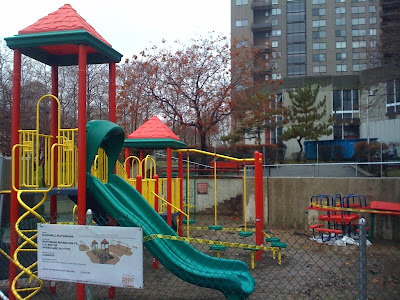 Steve said that it was impractical to complete the park first and he believed that the Franklin and Eleanor Roosevelt Institute (FERI) would get its necessary funding. I told Steve that, if RIOC is choosing not to do as residents wish, RIOC needs to provide a formal response about RIOC's actions, which are counter to the results of the referendum question. 3. RIOC agenda item – The Octagon: Authorization to waive the notice period and to consent to Multi- Employer Pension Trust (MEPT) Octagon LLC's financing its leasehold interest in the Octagon lease. In short, the owners of The Octagon want to take out $110 million from the development and mortgage it -- what you and I would call a home equity loan. RIOC's interest in this is that they might be able to get a recording fee of several million dollars, i.e., a piece of the action. Several residents raised concerns about whether or not this would be considered a predatory lending scenario. RIOC Board members said that the owner is contractually permitted to do this, and RIOC was merely helping to speed things up. This did not satisfy residents because the operating costs of The Octagon could exceed its operating income. Residents asked RIOC Board members, prior to agreement with owner, to confirm that this was not predatory lending. - PSD's budget is growing, with a large fleet of vehicles (4 patrol cars, 2 Segways, 9 bikes, a motorcycle, etc.) and a large staff -- yet we are told by PSD that we are safe and have no crime. This seems contradictory: no crime, yet more staff and more equipment. A resident from Eastwood (now Roosevelt Landings) said that one of the original reasons for PSD's creation was the lack of doorkeepers in Eastwood, and that if Eastwood were to get doormen, this might greatly reduce the need for PSD. - PSD wants money for their own gym for their off-duty officers. 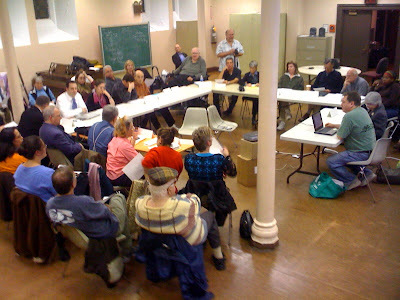 Residents were upset that money was being spent and existing space taken away (e.g., portions of the Main Street Theatre and Dance Alliance and the former bakery), while RIOC could better spend the money by adding equipment or hours to existing facilities, such as the Westview Pool or Sportspark. - PSD wants more space, including space for a "holding cell". This was an emotional topic, and residents want more involvement in this discussion. Many felt that the matter escalates friction with PSD. (There were several reports of problematic encounters with PSD.) One resident whose son has allegedly suffered abuse said that PSD Director Guerra endorsed the use of extreme force with teenagers because they don't respect PSD. We'll need to hear PSD's side of the story to get the full picture. In reaction to the 94% referendum vote favoring a citizens' review board for PSD, I reported Steve Shane's comments: RIOC will never provide a citizens' review board for PSD. This was certainly not well received by the residents. 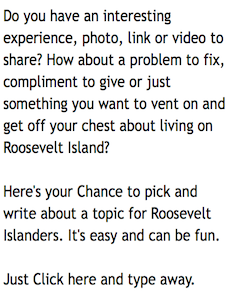 We'll need future town meetings devoted to PSD and its role on Roosevelt Island. 5. RIOC Real Estate Development Advisory Committee report: RIOC's Real Estate Committee has agreed to hire a consultant to investigate the empty store fronts. As pointed out by several residents, nothing has been done in the past 20 months of the current RIOC administration, and nothing has been done in the past five years. Residents demanded that RIOC agree to take action, not just hire another consultant. RIOC Board members said they would take these comments back to the Real Estate Committee (chaired by Charlee Miller, with members Dr. Kathie Grimm and Fay Christian). In response to the RIRA referendum question indicating a strong preference for a private developer to take over the commercial space, residents asked what RIOC was doing. My short summary of the discussion is: the Real Estate committee has not yet addressed the referendum results, but is likely to do so soon. 6. RIRA Common Council: The Council elected the following officers and committee chairs at its Wednesday night meeting: Charlie Berg, Secretary; Elizabeth Erickson, Communications chair; Margie Smith, Government Relations chair; Joyce Mincheff and Lynn Strong-Shinozaki, Housing co-chairs; Aaron Hamburger, Island Services chair; Matthew Katz, Planning chair; Ron Schuppert, Public Safety chair; Nikki Leopold, Social, Cultural, and Educational Services chair. 7. 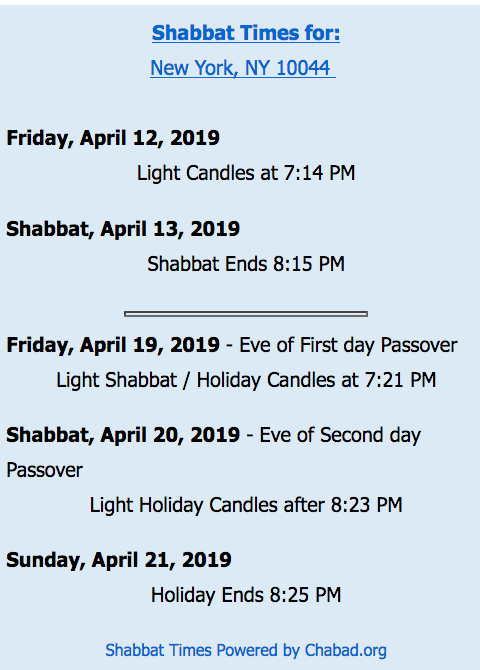 RIRA's 2009 Common Council meeting schedule: January 7, February 4, March 4, April 1, May 6, June 3, September 9, October 7, November 4, December 2 (all Wednesdays, 8:00 p.m., Good Shepherd Community Center). 8. Upcoming RIRA Town Meetings: Wednesday, January 14, and Wednesday, February 18. They will be held in advance of RIOC Board meetings. Steve Shane and I briefly discussed some areas of collaboration and cooperation, such as joint RIRARIOC sponsorship of the town meeting. I'm all for collaboration with RIOC. You can also read the RIRA President's Report in the Main Street WIRE. The RIRA Town Hall Meeting prior to RIOC Board of Directors meeting is an excellent idea since it allows residents to be informed of important Roosevelt Island issues before they are voted upon. (Whether or not a decision has been made on any particular issue before the vote is another question - don't know the answer to that, particularly with new Board). It may also be a great benefit to the RIOC resident Directors because it allows them to hear the community viewpoint on current Agenda items and may provide valuable information from residents with particular knowledge or expertise in the subject. RIRA President Farance should be congratulated for initiating this idea and RIOC Board Members Kalkin, Shinozaki and Christian thanked for participating as well. I hope that the other RIOC Board members will join their fellow Roosevelt Islanders and attend future RIRA Town Hall Meetings. RIOC President Steve Shane sends the latest update on Manhattan Park water main shutdown in front of 40 River Road. Latest word from DEP is that the job is now scheduled for Friday evening December 12, with shut off of water main to occur at 9PM and estimated to last 8-10 hours. 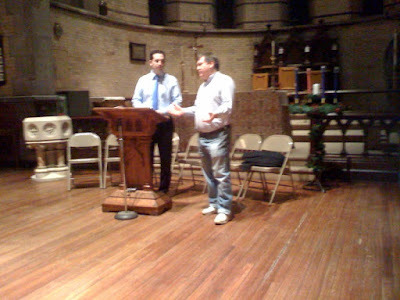 Manhattan Park residents have 8 elected representatives to the Roosevelt Island Residents Association (RIRA). We were elected on the 2nd November election. However, practically nobody knows us and therefore cannot air any concerns through us. Residents are not informed either of the RIRA monthly meetings and of what is in the agenda. I want to encourage all the elected common council members to make their contact info available to the people that elected them. I want to inform people of what RIRA is doing, has been doing and is planning to do. Manhattan Park Management has told me that I cannot post my information on the designated areas of the building, so there are few channels to use to connect residents. This blog is one of them. Ms. Perez-Cruz is particularly concerned with the electricity costs at Manhattan Park. I do not know how many people (if any) have requested to see their meter readings on electricity. But so far, all people I have contacted find their winter bills excessive. To request measurements of electricity would be a good start. The beginning of this is the high bill we get evidenced by their winter-sky rocketing. Is there anyone out there that have numbers to share with the rest of us? If any Manhattan Park resident would like to share their Con Ed electricity bill information in order to compare them with others, a Google Group for Manhattan Park has been established. Groups for Octagon and Eastwood (Roosevelt Landings) will be done shortly. 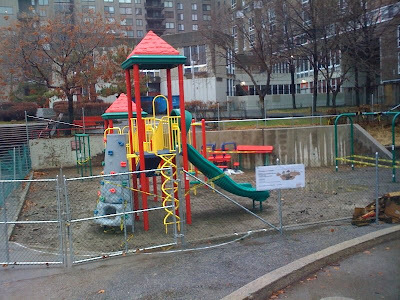 Roosevelt Island's PS/IS 217 PTA Meeting On Tuesday - Are RI Kids Avoiding This School? There will be a General Meeting of Roosevelt Island's PS/IS 217 Parents and Teachers Association (PTA) on Tuesday, December 9 at 6PM in the school's cafeteria. In 2006-07, PS/IS 217 received a B grade. 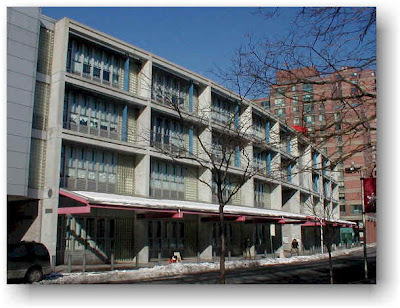 Here are some previous posts on Roosevelt Island's PS/IS 217 including information on math and reading scores, zoning and a parents plea for the establishment of a gifted and talented program. It seems like every time I talk to a parent they are all trying to figure out how they are going to get their children out of the school. I am amazed at how many students here on RI do not go to PS 217. Kids attending private schools while living in gov sub housing (how/why is this possible?). Kids attending schools in manhattan with "borrowed" addresses. Kids being home schooled. It is sad. If everyone chose to have their children attend PS 217 we would have an excellent school. 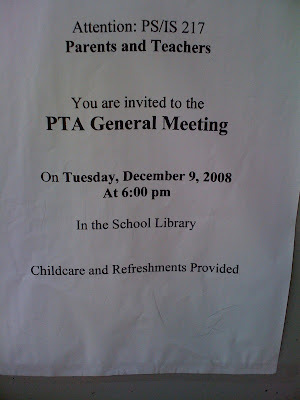 Unfortunately, attending a PTA meeting makes you realize how dysfunctional the school is, and how much work it would take to get it where it should be. For me, it is easier (stress-wise) to home school my kids, than to spend a year trying to "fix" the school like I did last year. For some reason there are people who defend the school to no end, but the reality is that if your child is advanced there is no opportunity for them at that school. It is unfortunate that the principal is anti-G&T programs. A. Have an administrative change. Clean sweep. There may be much to discuss at the PTA meeting.